Facebook has created a useful and interesting new update since moving the application tabs to the left hand column of the timeline. Since those call to actions were lost, Facebook has now given users a new way to gain more support. With the new “call-to-action” feature for Pages, page administers can choose to include buttons that will make it easier for others to support their page. According to this official Facebook article, the new feature created a 2.5x higher conversation rate for Pages, enhancing customer acquisition efforts. Do you manage a Facebook Page? Consider adding a Call-to-Action to direct your fans/users to a recent campaign for more support! Social media has been without a doubt a very prominent factor in this year’s presidential election. Lab42 recently performed a study surveying 500+ American social media users who were ages 18 and over. They came up with a pretty interesting infographic that broke down who registered Democrats, Republicans, Independents, and others are voting for. The infographic by Lab42 looks at some other interesting statistics such as what percentage of social media users tune in to satirical news shows such as The Daily Show and The Colbert Report. Registered Democrats and Independents were each about 17% above what registered Republicans reported. Take a scroll through the full infographic below to see the rest of Lab42’s unique statistics of American social media users. A few weeks ago, we launched our client CapoSonic’s awesome webpage, and now we have officially launched CapoSonic’s Kickstarter! Kickstarter is a funding platform for various types of projects. A funding goal is created with a deadline. If the project succeeds its goal, all “backers” who offered to contribute money are charged, if the project does not reach its goal, no one is charged. It’s up to YOU to give CapoSonic its kick start! Marketing over social networks used to be easy. You would create a MySpace page, upload a few songs and a picture or two and let millions of users do the rest by virtually spreading the word. Fast forward to now – boy, has that changed. With a seemingly ever-expanding plethora of social networking sites all trying to appeal to as broad an audience as possible, marketing yourself over these platforms has moved from hobby to chore to nearly a full time job. The typical artist must manage and keep up-to-date their Facebook, Twitter, YouTube, website, and any other social media platforms they’ve chosen to market themselves over. Most artists will confess that constantly updating each and every one of their online marketing platforms takes much longer than they’d prefer. The process is arduous at best, and any artist will acknowledge their true desire to use that time creating music. Yet, in the modern age it’s an integral portion of anyone’s marketing strategy. Enter Musedash, a new online application that lets musicians manage all their social network profiles from one main dashboard. From this dashboard, you can post content (be it status updates, links, news, or photos and videos) and choose to which networks you’d like the content to appear on. So you could simultaneously post a news article on your Facebook profile, your Facebook page, your Twitter, your MySpace, and any other applicable network – all with just one click. Musedash sets itself apart from competing services like Hootsuite and Ping.fm by catering specifically to musicians. And, recognizing that most musicians are not computer geeks in their spare time, creator Hilke Ros and the rest of the Musedash team have made user-friendliness a top priority. The result is a clean, simple and straightforward application designed to make social networking easier, not more complicated. Potentially, using Musedash to manage multiple social networks simultaneously could save valuable time and frustration, and would eliminate the possibility of mistakes or inconsistent information on different networks. A fantastic interview of Jack Johnson and his views on improving our environment! He also plays a great love song he wrote for his wife. The New Pages on Facebook Finally Streams In! The switch from the old profile to the new profile that Facebook pulled on its users in late December/early January anticipated some other alterations to occur. Alas, the new Pages on Facebook is here! The new Pages redesign resembles and operates like a user’s regular profile. However, there are multiple differences in regards to the Page’s and their admins. The new Pages consists of all the features of the new profile more or less. For example, the menu bar is on the left-hand column with links to the wall, photo albums, videos, tour dates, etc., which also eliminates the information box that was a component of the old profile and old pages of Facebook. The edit tab option has therefore also switched to the very top of the page. Admins can now click up top to edit their pages, which directs them to editing the info, apps, profile picture, marketing, etc. 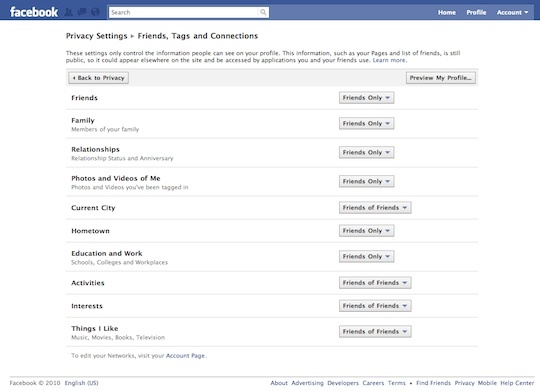 Facebook has rolled out some new privacy settings today in hopes to put their millions of users’ minds at ease. Also, maybe to shut a few people up, but that’s wishful thinking. Basically, the privacy page got redesigned so that it’s no longer confusing AND controversial. For example, a single click will now let users block all of their information from being accessed by third parties, such as game or application developers. In the past, users had to go on a little treasure hunt to find and turn off this setting. Applications will also have “dramatically less access to your information by default” according to Zuckerberg. Another noteworthy change - the information that is shown when someone searches for your name is now different. In the past, Facebook would show your name, gender, hometown, activities, profile photo and networks. Hometown and activities will now be private. The controls are definitely more simple but unfortunately not private by default. You still have to seek out privacy settings and change them if you care about controlling who sees what. If you’re too lazy to do that or don’t really care about all this privacy nonsense you can opt to use facebook’s “recommended” settings. Judging from their track record I’m sure they’ll have good recommendations. 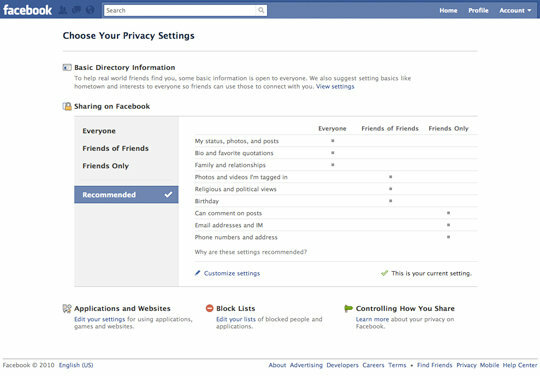 Check out Facebook’s Privacy Guide here. A Facebook Fan page is one of the many ways for fans to stay connected with you. More and more artists are recognizing the importance of a fan page. They are going beyond the standard lackluster fan page look and feel to create pages that fans actually enjoy using and interacting with. I have recently been browsing through the The Facebook Showcase blog to see what other artists, brands and businesses are doing to pimp out their fan pages. There are tons of great ideas and examples of excellent page designs there. One of the more notable fan pages (and also one that Oniracom designed!) can be found in the Celebrity and/or Enterainment categories - Lenny Kravitz! The Facebook Showcase describes the page as having “a nice tab promoting his new tour dates”. You can check out Lenny’s fan page here and “like it”! Todayâ€™s online networking environment requires simplicity and solutions in response to demand. First people demanded a more open Facebook, and now theyâ€™re demanding ease and integration. Everyone tweets, posts, updates, links, likes, comments, and tags these days, and although Facebook is admittedly the best, there will always be room for improvement. This stage in the social networking game will be won with easy and open integration. Facebook and Pandora are on the leading edge of the key players in this relatively new game. It seems that Facebook is doing away with dealing with ‘Fans’, substituting for the lighter-weight term ‘Like’. As far as I can tell (thus far), “liking” a page on Facebook is the exact same thing as “Becoming a Fan” was. Facebook has yet to change their “Become a Fan” button to the new “Like” button on some profiles and also the Fan Badges that you embed on your webpages. That’s right… We finally created a Facebook Page for Oniracom! We’ll be posting little updates about new sites, widgets, campaigns, and cool client news. Become a fan! 2/9/10 UPDATE: Dr. Dog was about to hit 20,000 fans on Facebook (solely credited to the hard work and promotion from their original fans), and then they decided they were going to give the exclusive release of the song to Stereogum. Yes, they will reach their end goal of getting 20,000 fans, but they didn’t reward their Facebook fans whatsoever. Bad practice in my opinion. The indie-rock/soul band Dr. Dog has made a deal with their fans: Get us to 20,000 fans on Facebook, and we’ll let you hear the first track off the new album. When they originally posted this, they were around 7,000 fans on Facebook, so they were asking of a pretty big feat. Each fan needed to convince two of their friends to become a fan of Dr. Dog. Two weeks after posting their proposition, they had doubled their Facebook fans, and are quickly continuing to grow. One thing you need to know: this won’t work for every band. Dr. Dog is one of those bands that is known for having a small, but incredibly devoted fan base (another example: Delta Spirit). It’s much better to have 10 super fans over 100 regular fans. Their fans probably like other indie-underground bands, and they are probably the friend in the group that is always listening to a new band. Now they have a payoff for spreading the word: they get to hear the new single first. The fans are the most important thing you have. Give them incentive, and let them do the work for you. During the summer of 2009, Lenny Kravitz embarked on a huge European Tour in support of his “Let Love Rule 20(09)â€ re-release. We leveraged some serious social media tactics through the use of Facebook, Twitter, MySpace, YouTube, Kyte, iLike and more. One of the most notable social media campaigns that we created used a very powerful Facebook tool: photo-tagging.